I also have more stacks of pans on shelves in the basement. I desperately need a better organization system. This is the pan my mom used the most when I was a child. This single pan created dolls, Wonder Woman, Cub Scouts and many ice cream cones. It's from before I was even born and still bakes a beautiful cake. I've used it to make Alice in Wonderland. And more recently my own Velma birthday cake last year. Hal Jordan as Green Lantern for Thing Two's sixth birthday. This is another favorite. I wanted this pan and cake desperately when I was a little girl. I would fondly touch the page at the back of my mom's Wilton catalogs each year dreaming about this cake. Without that pan my mom made me this awesome cake in 1978 for my fabulous Wonder Woman birthday party from the pan mentioned above. The party where Linda Carter (note the spelling, it was a friend's secretary) called to wish me a happy birthday and all the four year old girls wore yellow headbands with red stars across our foreheads and chased the boys across the yard. 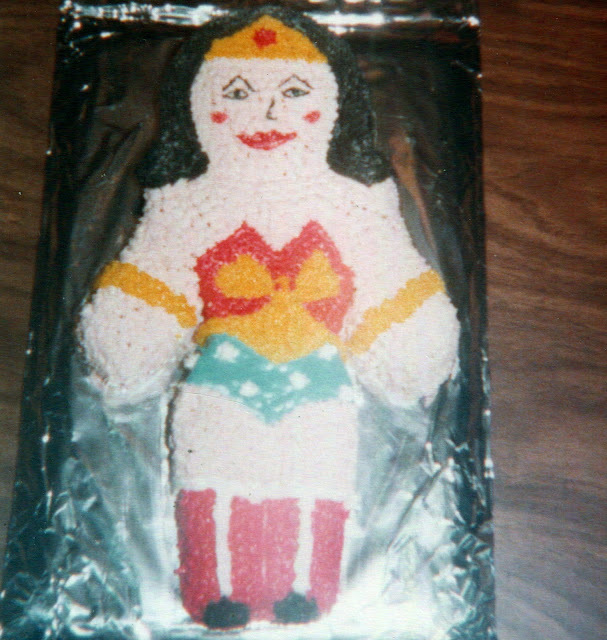 But now that I finally scored this gem from the seventies, I had to make my own Wonder Woman cake. And she was everything I hoped she'd be! I was four years old again. Vader is my only pan from the Star Wars collection Wilton sold in the early 80s. I'm always on the lookout in thrift stores and garage sales for the R2D2 pan and the much harder to find Boba Fett pan. I've made a Vader cake many times, once I even made a black rice crispy treat in him. My favorite has to be the solid chocolate candy mold I made from it. But my favorite Star Wars cake is of course the towering Death Star cake I made Thing Two last year for his seventh birthday. I was nervous about pulling off the multicolored fur. I'd never attempted such a thing. However, I'm very pleased with how Newton's fur turned out. 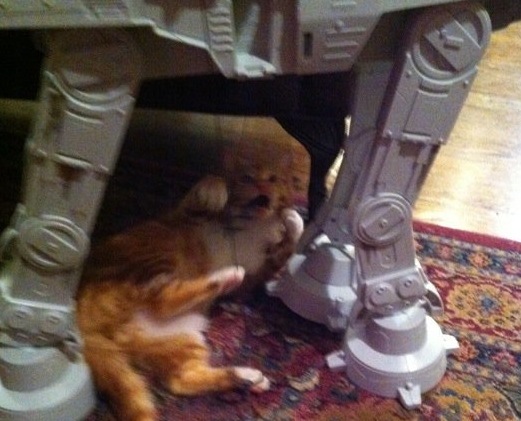 And better yet the birthday girl declared it looked just like her cat...and that ultimately is all that ever matters. If you're so inclined and killing time wandering the web you can see more pictures of cakes I decorated at my flickr collection here.